The world defines success in terms of possessions and positions. Yet celebrities who have these things sometimes commit suicide. Not infrequently, people feted publically as success stories are privately such sorry stories as to be depressed, paranoid, addicted. Such “successful failures” beg the question: What is the point of success? The point is love. We all want to love and be loved. And we believe that becoming successful will make us more loveable in the world’s eyes. However, the world’s eyes are notoriously fickle – they abandon us as soon as someone else’s trappings of success supersede ours. Those who mistake the world’s adulation for affection live in fear of losing that adulation. And when it is eventually lost by time’s inexorable march, they are left devastated. To fulfill our drive for success and longing for love, we need to be spiritually guided. Gita wisdom explains that we are at our core souls, who are parts of the all-attractive supreme, Krishna. He is supremely loving and supremely lovable. In loving him, we find everlasting happiness. Becoming devotionally absorbed in him is life’s supreme success. 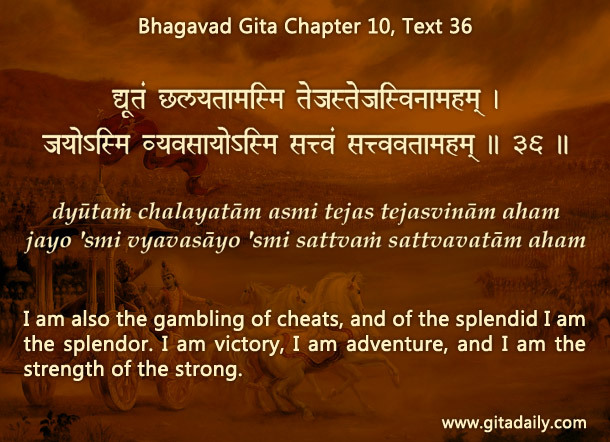 When we experience the exhilaration of worldly success, we are actually experiencing Krishna, for success is one of his opulent manifestations (Bhagavad-gita 10.36). Indeed, He is the essence of success. Moreover, he manifests as our abilities (07.08). Our abilities are his gifts meant to help us serve him in this world and attain him in the next. As he is the ability that enables us to succeed, he is the ultimate source of all success. The point of success, of enjoying the thrill of victory, is to direct our heart to where that thrill can be relished forever: in loving the one who is the essence and source of success.